Congratulations to Camilla Iannone who has been awarded a Marie Skłodowska-Curie Postdoctoral Fellowship. Camilla received her PhD in 2014 from the Universitat Pompeu Fabra, Barcelona, Spain, for her work on functional relationship between chromatin structure and pre-mRNA processing, in the laboratory of Prof Juan Valcàrcel at the Centre for Genomic Regulation. Her thesis work was published in the journals RNA and Genome Biology. In October 2015, she joined the laboratory of Eugene Makeyev, where she has been working on understanding dynamics of RNA processing and stability in neuronal development. 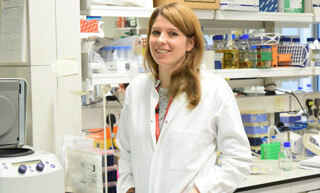 Over the next two years, Camilla will use the Marie Skłodowska-Curie Postdoctoral Fellowship to understand how AS-NMD activity changes during neuronal development and uncover novel mechanisms allowing neurons to attain their unique morphological and functional properties.